The moral of this little blog post today is this: If you have a donut pan that you haven't used in a while, take it out for a spin and have a little fun. You'll remember why baking donuts at home makes you smile. And you get to eat chocolate cake in the round, and with your hands! Preheat oven to 375 degrees. Grease a 6-capacity donut pan. In a medium bowl, sift together the flour, cocoa powder, sugar, baking soda, and salt. In a measuring cup or small bowl, whisk the buttermilk, oil, egg, and vanilla extract together. Add wet ingredients into the dry and stir together until almost combined. Toss in mini chocolate chips and stir until just incorporated. The batter will be thick. Divide the batter among the 6 donut molds (I use two spoons), smoothing the tops. Bake for about 8 minutes, or until the donuts spring back when lightly touched. Remove from the oven and immediately turn donuts out from the pan to cool on a wire rack. Glaze and top the cooled donuts with glaze of your choice. Whisk 1 cup powdered sugar with 1/4 teaspoon peppermint extract, 1 drop of green food coloring (optional), and 1 1/2 tablespoons of milk. Add more milk, as needed, until glaze comes to a smooth, thick consistency. Spoon glaze over donuts (or carefully dip the top half) and top with mini chocolate chips or chocolate curls. Let glaze set before serving. Whisk 1 cup powdered sugar with 1 tablespoon creamy peanut butter and 1 tablespoon milk. Add more milk, as needed, until glaze is a smooth, thick consistency. Spoon over donuts (or carefully dip the top half) and add toppings, if desired. Let glaze set before serving. Whisk 1 cup powdered sugar with 2 tablespoons strong coffee. Add more coffee, as needed, until glaze is a smooth, thick consistency. Spoon over donuts (or carefully dip the top half) and add toppings, if desired. Let glaze set before serving. I feel so sorry for my donut pan - I never get it out anymore :( But I love the inspiration here! Chocolate is always a favorite and especially with buttermilk. I see we are expecting 80 degree weather later this week - and I bet you'll have some warm days too. Enjoy the early spring! haha - I'm sure your little grandson would like a baked donut from grandma! ; ) This weather has been interesting...I have been soaking up the sun and I'm not complaining. It'll hit 70 here on Thursday but it's going to be a wet one. I am glad to make donuts w/o the need for a snow day. I haven't used mine in years...this recipe is so perfect. Most recipes I saw online are for 12 or more and that's just way too much for just two of us. Plus chocolate is always good :-), even on those snowless days! This will make exactly 6 so it's great! I'll take one of each please and thank you!! I never bought a donut pan but I always think about it when I see recipes! These sound too good!! It's another excuse/way to eat chocolate cake here, frankly...and we loved it. The pan is so little that it's easy to forget about it when you have it. I am glad we took it out for a spin. Oh my goodness!!! 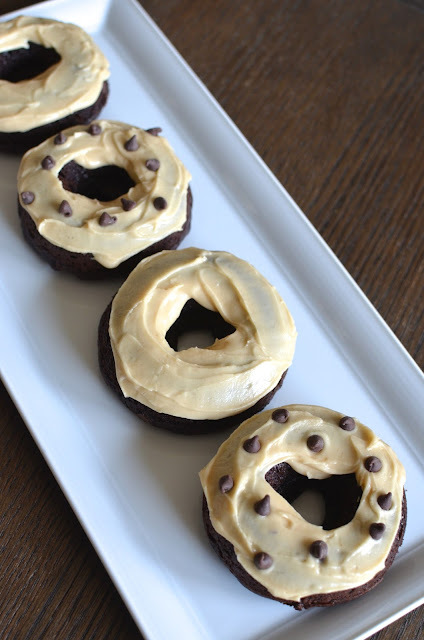 These chocolate donuts look fab! A perfect breakfast and snack! Fantastic donuts and and equally delicious glazes. I love how you've decorated them.I'll have one of each please! Baking donuts is fun - thanks, Sonali. Btw, my mum was an expert in donuts. The best I have tasted after those of my mum are from Crosstown Doughnut & Coffee Bar in London. They are a HIT, I even made a post. I understand...we can't like everything. Funny enough, I didn't grow up eating much peanut butter or liking it much quite frankly...but somehow in the last few years, I have really come to love it. : ) Your mum sounds wonderful, as do her donuts and the places you mentioned! I love peanut butter, in Africa, where mum grew up, there was a culinary specialty called "peanut butter chicken". This is one of my favorite dishes, it is creamy and fragrant. Strangely, I'm fond of peanut butter in salted dishes. Yeah, like you my mum is addicted to homemade food. She is an wonderful "chef". 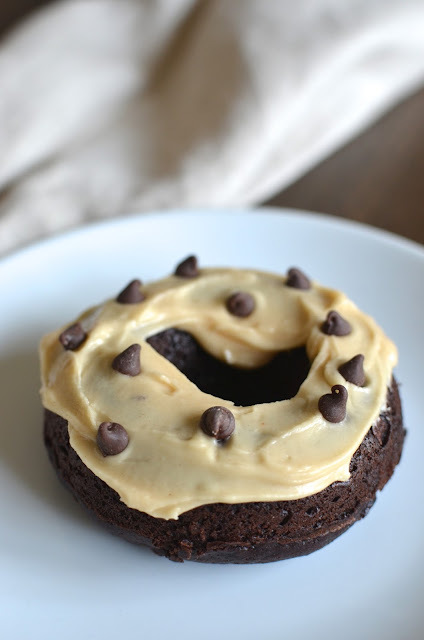 I see...you just don't love the combo of chocolate and peanut butter in donuts. I do love peanut butter in savory dishes, too. Love thai peanut sauce, peanut noodles and the like. That chicken dish sounds wonderful...and your mum sounds like a fun person to be with!! These look so delicious! Great idea to break out the pan again! It's been too long since I've made donuts and I love that these make a small batch. Both the peanut butter and mint glaze sound perfect! Yes, break up the donut pan. I like to think back on things/recipes I haven't made and just give it a go. These went quick. Have a great week, Kelly! haha - thanks, Cheri. Funny I try not to buy buttermilk too often and to wait until I've a couple of recipes in mind...but I find myself wanting/needing to make buttermilk pancakes/waffles or some other recipe all the time (buttermilk is good for so many things) so it's often in the fridge afte rall! Oh, delish. I love chocolates anything and my daughter loves chocolates and donuts both. So I can tell that we both would adore these donuts. Loved the fact that you baked them. Your donuts look awesome Monica...and I love the glazes...I do not own a donut pan...after seeing your post, I am very tempted to get one. I wish I could swap you a donut for a couple slices of your bread, Juliana! I really like baked doughnuts! I bet the chocolate chips are so good to bite into! Think back 5, 10, 15 years, and try to remember all of the mom and pop retail bakeries that existed. In every ethnic Baked comfort food you had the Jewish Bakery, the German Bakery, the Italian Bakery and so on. My dad once owned eight bakeries in various neighborhoods throughout the Philadelphia area.